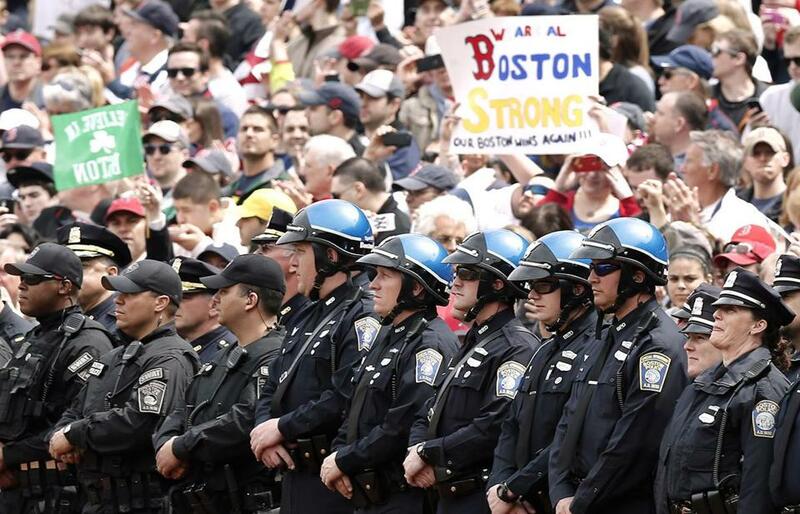 It's been 11 days since Boston was ripped apart and the nation was rattled. And a week since the city was paralyzed by a lockdown and shooting spree/manhunt. Was there any good from what happened at the Boston Marathon and the subsequent manhunt and mayhem? The victims will be present in the hearts and minds of the Bay State for generations. The spotlight now shifts toward the survivors - as fans of the city and humanity move on with their lives. 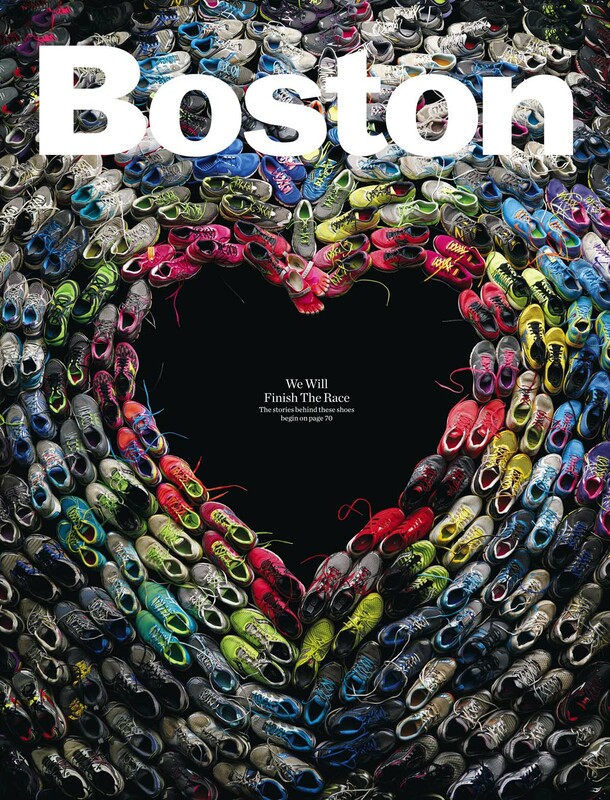 The stories of those affected by the Marathon bombings and their aftermath will be a part of the conversation for the foreseeable future. There's been much good since the bombs went off and the city was placed on lockdown - in addition to the heroism displayed on Patriot's Day and again last Thursday and Friday. Here are 10 signs of hope amid the pain, sorrow and loss. 1. The list of charitable endeavors helping Marathon victims is extensive. The One Fund has raised more than $25 million on its own through individual and corporate donations. 2. The next time you think you can't do something - anything - just watch this video. It's a compilation of advice and support offered by U.S. veterans who lost limbs in service to their country. The Virginia company Shoulder 2 Shoulder, which is operated by wounded veterans, posted this clip on its You Tube channel. 3. Boston Magazine found a stunningly beautiful and poignant way to honor the Marathon victims and runners in its May cover. The cover reads "We Will Finish The Race" and is an image taken from shoe of some of the people who ran the race. A perfect confluence of photography, art and storytelling. The story behind the cover is almost as interesting as the cover itself. 4. When Watertown police chief Ed Deveau appeared on WEEI radio earlier this week, he said his department was swamped with requests for official Watertown Police Department merchandise. The department was able to quickly assemble enough hats for the Boston Bruins to wear before SaturdayÃ¯Â¿Â½s game against Pittsburgh. Ã¯Â¿Â½We donÃ¯Â¿Â½t have Watertown Police hats -- no one ever wanted one before. We had to get them made up before the game,Ã¯Â¿Â½ Deveau said. 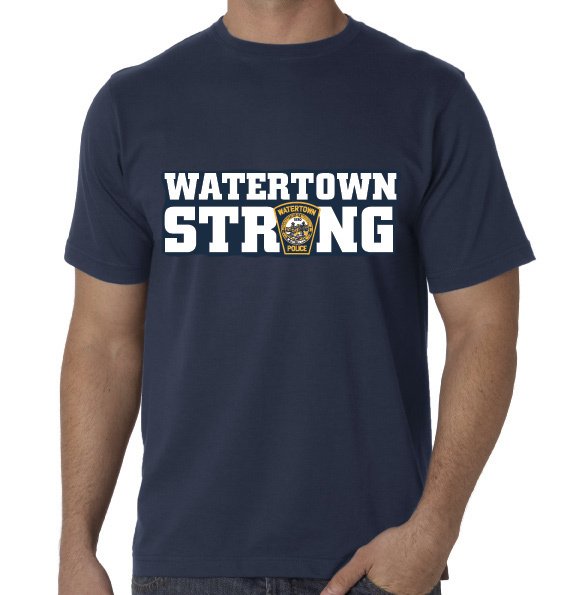 There's no word on the hats, but there "Watertown Strong" t-shirts for sale via the Watertown Police Store. Profits from the sale of the shirts go to the department and a fund to be established later. Check out this list of 10 shirts you can buy to raise money for Marathon victims. WAAF morning radio host Greg Hill has raised $243, 574 as of Thursday through his charitable efforts via the Greg Hill Foundation. All of that money raised will go directly to help victims and their families. The group TUGG - Technology Underwriting Greater Good - has raised more than $280,000, including about $4,500 from a meet up Wednesday night. Barstool Sports Boston raised $192,000 through the sales of various t-shirts which included "Boston Strong," "Massachusetts Invented America" and a few other choice phrases. 5. Boston's athletes deserve much credit for their willingness to take a leading role in helping to heal the city and comfort the victims. Much of that comforting it was done in private and with great sincerity and humility. And no one summed it all up better than David Ortiz did last Saturday. So much of what we see in sports is contrived, but the love for the city displayed by so many of Boston's pro athletes in the past week makes it that much more difficult the next time they strike out, brick a free-throw, miss the empty net or drop an open pass. More importantly, they've opened their wallets. For instance, the Kraft family donated $617,000 (we get it) to the One Fund. That's also the Patriot Way. 6. Facebook has been a great means to raise awareness, the mourn the victims and offer those injured support and encouragement. The "Patrick and Jess Running Again" page has done a wonderful job in keeping people informed of the condition of the Patrick and Jess Downes, both of whom lost a leg in last Monday's blast. The above photo was from an running event held in Washington, where hundreds gathered at the National Mall in Washington DC to run 4.09 (official marathon time) miles for Boston. "Many of us ran for Patrick and Jess. We sang 'Sweet Caroline' at the finish line. We are all sending positive and healing thoughts to you from DC," wrote Rachel Bloom, a former co-worker with Patrick from The Gifford School. The page has solicited more than 60 videos from the public to offer their encouragement to the couple, including this one from actress Fran Drescher. And this quick message of support from Red Sox second baseman Dustin Pedroia. More than $500,000 has been raised for the couple through family, friends and strangers through two crowdfunding sites. 7. The Celeste and Sydney Recovery Fund has generated more than $650,000 via its gofundme page. Sydney's cousin, Alyssa Carter, also created the Celeste and Sydney Corcoran Support Page that has gotten more than 15,000 likes. The mother and daughter were both badly injured by the blast, with Celeste losing both her legs below her knees. Kevin Corcoran was photographed with his wife after the blast in a photo seen world-wide. "Before they put me under, I just wanted to die. Then I thought, I can't, I can't, there's too much do to," Celeste told the TODAY show Friday. 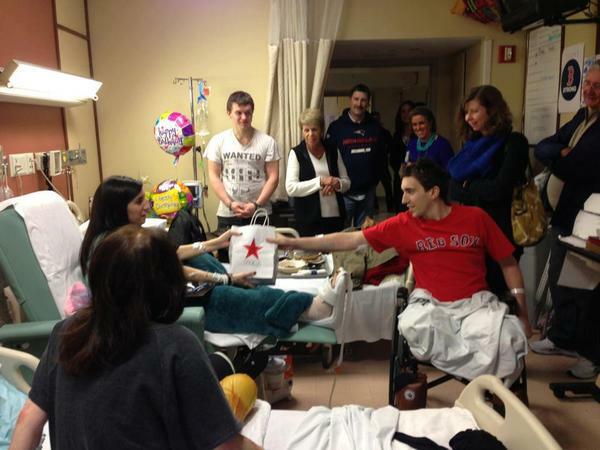 It posted the below photo of Marathon amputee victim Jeff Bauman paying Sandy a visit on her 18th birthday Tuesday. The photo, which ran with the caption "Jeff Bauman visited today and gave Sydney a birthday gift -- what a sweetheart! Very emotional and awesome experience for all involved." - received more than 14,000 likes and was shared over 1,600, in addition to being published on news sites around the world. The latest update on their condition, posted late Wednesday, gave some encouraging news. "Another day of progress! Sydney was up and down stairs on crutches and Celeste was able to follow her in the hall in a wheelchair on her own. They unwrapped the bandages on Celeste's legs and she was able actually see her legs for the first time. It was certainly emotional, but "not as bad" as she thought it would be. Tonight, Celeste and Sydney are getting massages to help them relax. They both will be discharged from the hospital this weekend and rehab will begin! " A video of several Marines paying both women a visit racked up nearly 250,000 views on You Tube in less than 48 hours. As one of the wounded warriors says while pointing to where Celeste's legs would have been. "This doesn't matter. This is just a chance of scenery." The family is scheduled to be featured on NBC's "Rock Center" later tonight. 8. The Jeff Bauman - Boston Strong, True Patriot and Hero Facebook page was started by someone not affiliated with Bauman but has had continual input from his family. It has more than 84,000 likes. Bauman, who lost both his legs in the attack, was on WEEI's Dennis and Callahan show Friday. "I'm alive, he's dead," Bauman said of his attackers. He also said he's begun the rehabilitation phase of his recovery. Among those who stopped by his room: Shawn Thornton of the Bruins and Bradley Cooper of "Hangover" and "Silver Linings Playbook" fame. As soon as Bauman was alert, he wrote down his description of Speed Bump - also know as Suspect No. 1 - which was pivotal in helping the police. The Bauman page includes updates from Bauman's family and links to the story about Bauman's rescue at the Marathon by cowboy-hatted hero Carlos Arredondo. It links to the lone official fundraising site authorized by Bauman's family - Bucks for Bauman! - which was begun by Brooke Gibbs and her brother, who was Bauman's best friend since childhood. The site launched nine days ago and had generated more than $688,000 of its $1 million stated goal. 'We were surprised to step off of the elevator and run in to Rob Gronkowski and Stevan Ridley, but even more excited to see a smiling Jeff wheel himself down to meet them. Like his best friend John said, Jeff was more concerned with Rob's injuries and how the Patriots were going to step up their game. I believe his exact words were "so...going to have some good games? "...they assured us they would try." It also posted this update about the page itself. "We are not an official representative for Jeff. However, we are in constant contact with his family and friends and are forwarding urgent messages to them as well as getting updates. The outpouring of love has meant a lot to them all including Jeff ... We are getting thousands of messages, and clearly Jeff isn't able to read through them all quite yet. When Jeff is better we hope to find out all the ways we can help him. But at this time he must focus on his immediate priorities of getting better." "He is in great spirits, wheeling himself around, and appreciate all that has been done. We never imagined to be bringing our goal to 1 million, and now it is in reach!! We couldn't have done it without your help. I cannot express enough gratitude for anyone to understand just how thankful we are." 9. Dave Henneberry has done more for smoking than Don Draper and the Marlboro Man combined. I don't smoke. My house was full of smoke growing up. Hated it. But at the same time, smokers have been needlessly demonized. Henneberry went outside to fire-up a heater in Watertown Friday after a day of nicotine deprivation and ended up doing something thousands of cops and the FBI couldn't - he found Speed Bump's little brother. His boat got shot up - amazing how many police bullets missed their target last Thursday night and Friday - but Henneberry refused charitable efforts to replace it, saying the money should go toward the real victims. After all, he has a canoe. If anything, he's earned free Camels and the right to smoke inside Dunkin' Donuts for the rest of his life. 10. It's becoming apparent that lots of folks screwed up big time leading up to this. But remember, it's only been 11 days since this happened. Time will be the great equalizer when it comes to finding the truth of what and who caused this, who funded the bombers (in addition to the taxpayers) and most importantly, what must be done to make sure it doesn't happen again. Try to be patient if the upside means learning the truth. Quick rundown on the hot sports topics of the day as you look forward to a "lockdown-free" weekend. What was the highlight of the first round of the NFL draft? The Manti Te'o jokes on Twitter. This week's ESPN "30-for-30" documentary about the 1983 draft - yep, the one 30 years ago - was infinitely more interesting than anything that happened Thursday. Or will happen the rest of the weekend. The Patriots made a first-round trade. There's a shocker. Should Andrew Bailey remain the Red Sox closer once Joel "Gagne" Hanrahan gets off the DL? Yes. Remember, Bailey lost his closer job due to injury, so that argument goes out the window. It's easy to realize what's going to happen - the Red Sox will make Hanrahan the closer because that's what they told him when he was signed. This situation is the same as the Stephen Drew/Jose Iglesias dilemma. Iglesias was hitting about .900 when he was sent down because the Red Sox had to insert Drew and his $9 million paycheck into the lineup. At last check, J.D. Jr., was batting .119. The Red Sox are white hot, so this misstep will be easily swept under the rug for the time being. The question should be whether or not Bailey or Hanrahan is best equipped physically and mentally to handle the job. Right now, it appears to be Bailey on all fronts. In seven save opportunities, he's 1-0 with five saves. Despite the occasional home run or on-the-line double/foul ball, Bailey has the makeup to be a closer in Boston. Felt that way when he replaced Jonathan Papelbon. The acquisition of Bailey was the lone bright spot in the Nuclear Autumn and Winter of 2011-12. His 19-pitch, three-strikeout save Wednesday was Papelbon-esque in its drama. "That was a manly save," pitching coach Juan Nieves told the Globe, in another refreshing episode of political incorrectness from the Red Sox. Keep this up boys and I'll buy Wally dolls for all my nieces and nephews. The door on this team closed when Kendrick Perkins went down in the 2010 NBA Finals. Will the Bruins "flip the switch" in time for the playoffs? They will play better than in May than they played in April. Thursday's win over Tampa Bay was minimal progress. It's not encouraging that lines are still subject to change at this date. In their defense, they tried to get the best possible players to help out late in the season. The Jarome Iginla decision wasn't theirs, but they were able to get Jagr and Carl Soderberg, both of whom will continue to improve as the playoffs progress. As always, let us know what you think. Post your thoughts here, on our Obnoxious Boston Fan Facebook page, on Twitter @realOBF or e-mail me at obnoxiousbostonfan@hotmail.com.